Mullen, Patrick. "Toronto International Film Festival (TIFF)". The Canadian Encyclopedia, 28 February 2019, Historica Canada. https://www.thecanadianencyclopedia.ca/en/article/toronto-international-film-festival. Accessed 25 April 2019. The Toronto International Film Festival (TIFF) runs annually for 10 days in September beginning on the Thursday after Labour Day. The largest film festival in North America, its international stature is second only to the Cannes Film Festival. 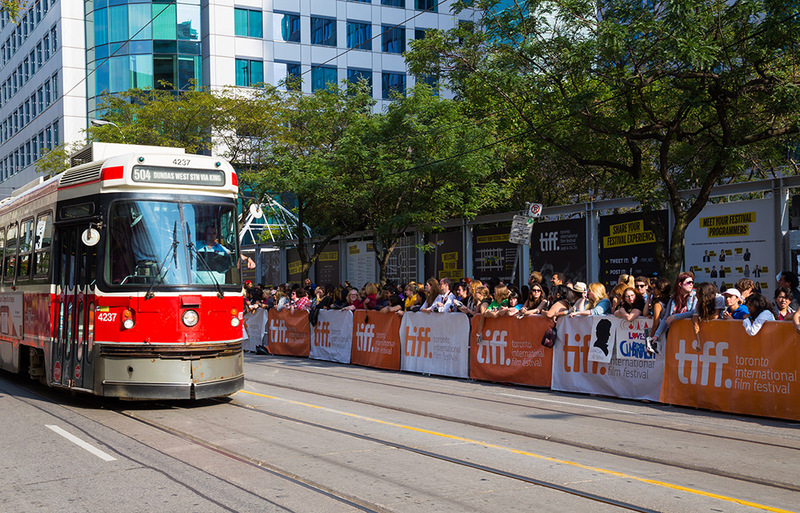 Unlike most major film festivals, which are open only to members of the industry and media, TIFF’s status as a public festival has made it an ideal testing ground for a film’s commercial appeal. That, combined with its September schedule, has made it a major launching pad for Oscar contenders and the more serious fare of the fall film schedule. It has also proven to be a key showcase for Canadian cinema, documentary films and experimental works. The 2016 edition of TIFF featured 397 films (296 features and 101 shorts), 138 of which were world premieres, while the 2017 lineup was streamlined by 20 per cent. Nicolas Cage at the Toronto International Film Festival, 14 September 2011. TIFF began in 1976 as the Festival of Festivals. Festival founders Bill Marshall, Dusty Cohl and Henk Van Der Kolk decided to bring the best films from other festivals around the world to Toronto. After they found that other festivals treated guests coldly, they strove to attract major Hollywood productions by emphasizing hospitality. They hoped that such an initiative would bolster Canada’s fledgling film industry, and stimulate creative and commercial interests. The festival was renamed the Toronto International Film Festival in 1994. Also that year, its year-round programs became housed under the umbrella of the Toronto International Film Festival Group. The organization as a whole was officially rebranded as TIFF in 2009. The departments at the festival have grown as the annual event has expanded, going from a small staff to an organization that employs nearly 300 people annually across 33 departments. Roles within the organization are divided into various departments, including: Programming, which leads film selections by vetting submissions and soliciting films; Development, which secures sponsorship; Front-of-House, which coordinates the logistics of each screening; and Communications, which handles publicity and media relations. The title of TIFF’s artistic director has fluctuated as the festival evolved, beginning with festival directors Wayne Clarkson (1978–86) and Leonard Schein (1986). Roles expanded to reflect the growth of the festival, with Helga Stephenson becoming the executive director (1987–94) and Piers Handling the programming director (1987–93). Handling succeeded Stephenson as executive director (1994–2018) and served as co-director with both Noah Cowan (2004–08) and Cameron Bailey (2008–12). In 2012, Bailey assumed the title of artistic director and Handling became director and CEO. Prior to the 2017 festival, Handling announced that he would be stepping down following the 2018 festival. The inaugural Festival of Festivals ran 18–24 October 1976. Organizers planned to open with a preview of the Woody Guthrie biopic Bound for Glory, but United Artists overrode the wishes of director Hal Ashby and pulled the film. The festival instead opened with the French film Cousin, Cousine, which led to the habit of showing European films that were easier to secure, as Hollywood producers feared the festival would cannibalize their audience. The first year saw mixed results with celebrities like Jack Nicholson and Julie Christie failing to appear. Even local press were indifferent. However, Barbara Kopple’s feature documentary Harlan County, U.S.A. premiered to an enthusiastic audience and went on to win the Academy Award, an early indicator that the festival was an ideal testing ground for audience reception. Results improved in the festival’s second year when the event was moved to September, and drew more stars and press. The following year, 1978, featured an opening night sensation when In Praise of Older Women, from ambitious young producer Robert Lantos, faced censorship from the Ontario Censor Board. The festival capitalized on the controversy to build hype, and the premiere oversold and saw a near-riot as patrons with tickets were unable to attend. The industry component of the festival also grew in 1978 and 1979 with the introduction of the Symposium and Trade Forum, respectively. The festival initially faced competition with the Montréal World Film Festival (MWFF), as both events competed for titles, stars and attention. The rivalry was so intense that MWFF director Serge Losique reportedly shipped films back to their home countries, rather than to Toronto, which immediately followed the Montréal festival. However, by the mid-1990s, Toronto had surpassed the Montréal festival in terms of influence and stature. The festival’s profile grew in the early 1980s with tributes to Martin Scorsese (1982) and Robert Duvall (1983) curated by film critics Roger Ebert and Gene Siskel. The festival also began to make a name for itself as a trend-setter in 1981. Jean-Jacques Beineix’s thriller Diva, which had flopped upon its initial European release, went on to become an international art-house hit after generating positive buzz at the festival. Meanwhile, Chariots of Fire, which won the People’s Choice Award that year, went on to win the Oscar for Best Picture. The Contemporary World Cinema program, which spotlights international cinema, was introduced in 1983, which proved to be a landmark year for the festival. That year’s edition opened with Lawrence Kasdan’s The Big Chill, which Columbia Pictures opted to screen because it was unsure of the film’s potential. The opening night premiere drew stars including Glenn Close, Kevin Kline and William Hurt, who walked to the theatre instead of arriving in a limousine. The Big Chill won the People’s Choice Award and became one of the year’s biggest hits, earning three Oscar nominations including Best Picture. The following year featured a Warren Beatty tribute and saw the attendance of far more stars as the festival grew in scale and stature. The parties became fancier and more exclusive. More Canadian, foreign and independent films began to achieve international success after launching at the festival, including Denys Arcand’s Le déclin de l'empire américain (1986) and Jésus de Montréal (1989), and Pedro Almodóvar’s Women on the Verge of a Nervous Breakdown (1988). In 1988, the festival launched the Midnight Madness program, which offers late-night screenings for fans of horror and alternative cinema. The program developed into a mini-festival within the larger festival and became hugely popular in 1992 when Quentin Tarantino reportedly attended every screening. The festival held its first museum exhibit in 1993 with The Strange Objects of David Cronenberg’s Desire, which travelled to museums internationally. These years proved that the recipe of the Festival of Festivals worked. By combining hype, star power and industry events, the festival could catapult underdog films onto the same plane as Hollywood heavyweights. The Festival of Festivals rebranded itself as the Toronto International Film Festival (TIFF) in 1994. That same year, TIFF launched Planet Africa, a program devoted to African cinema and films of the African diaspora, which ran until 2005. A tipping point occurred in 1999 when Sam Mendes’s suburban satire American Beauty had its world premiere at the festival and won the People’s Choice Award. Positioned as the zeitgeist film of the year, it went on to win five Academy Awards including Best Picture. This firmly established TIFF’s stature as a prestigious Oscar launching pad, a reputation that was solidified over the next five years when other winners of the People’s Choice Award — Crouching Tiger, Hidden Dragon (2000), Amélie (2001), Whale Rider (2002) and Hotel Rwanda (2004) — went on to achieve significant Oscar attention as well as critical and commercial success. TIFF’s reputation as an audience-savvy festival in touch with the tastes of the global marketplace was cemented further in 2008 with Danny Boyle’s Slumdog Millionaire, an independent drama about a Mumbai teen attempting to find his long-lost love. Slumdog’s distributor planned to release it direct-to-video until it became the sleeper hit of the festival and won the People’s Choice Award. After Fox Searchlight Pictures released it theatrically, the film grossed more than $375 million worldwide and won eight Academy Awards. For the first time in years, a non-Canadian film opened TIFF in 2009 with the British Charles Darwin biopic Creation. TIFF has since opened with several Hollywood films including Looper (2012), The Judge (2014) and The Magnificent Seven	(2016). Beginning in 2014, TIFF transformed a portion of King Street West outside TIFF Bell Lightbox into Festival Street, a pedestrian-friendly festival offering music, activities, pop-up events and food trucks. TIFF Bell Lightbox, 28 August 2010. In 2003, TIFF unveiled plans for a year-round home for the festival and its affiliated programs. 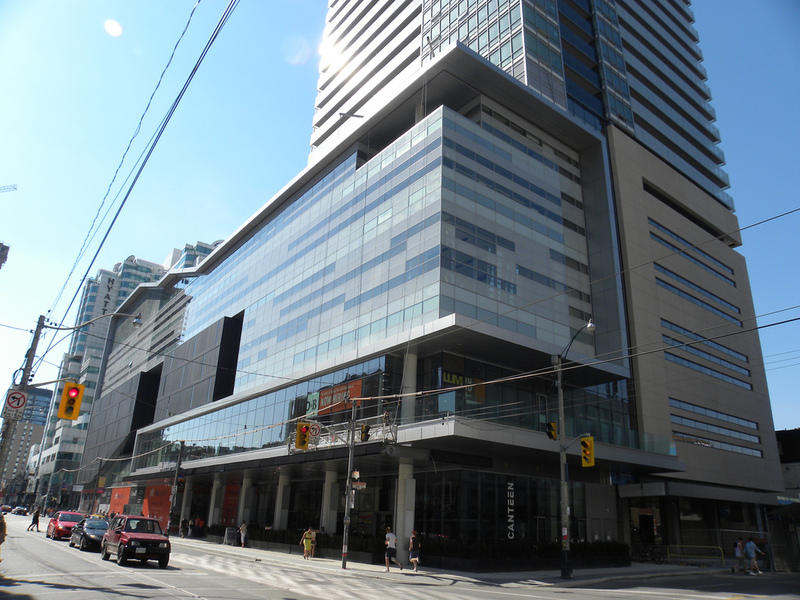 TIFF Bell Lightbox, located at King Street and John Street in Toronto’s entertainment district, was built on a former car wash site owned by the parents of filmmaker Ivan Reitman, whose family donated the property. Construction began in 2007 with designs by Kuwabara Payne McKenna Blumberg. TIFF Bell Lightbox opened at the 2010 festival with the world premiere of Bruce McDonald’s Trigger. In addition to three floors of office space, the venue contains five public cinemas that screen films year-round, the Film Reference Library, galleries, learning centres and two restaurants beneath a condominium. The space also hosts several exhibitions annually; these have included a showcase of Tim Burton’s artwork, a collection of work by David Cronenberg, a Federico Fellini exhibit and a display of James Bond memorabilia. A retrospective on Québécois cinema in 1977 marked the festival’s first major Canadian film spotlight, while a David Cronenberg retrospective in 1983 helped bring the director’s work to mainstream attention. In 1984, the festival launched the Perspective Canada program, which ensured space in the lineup to Canadian filmmakers. Perspective Canada helped to foster and propel the careers of many filmmakers, including Bruce McDonald, Denys Arcand, Jean-Claude Lauzon, Léa Pool, Don McKellar, Peter Mettler, Patricia Rozema, John Greyson, Clement Virgo, Deepa Mehta, Jeremy Podeswa and, perhaps most notably, Atom Egoyan. Also in 1984, the festival helped establish a canon for Canadian cinema by polling critics to determine the top 10 Canadian films of all time. These films joined additional Canadian classics in that year’s Northern Lights retrospective — the largest compendium of Canadian films to that time. TIFF continues to conduct its poll of the top 10 Canadian films of all time roughly every 10 years. In 2001, TIFF started Canada’s Top Ten, an unranked list of the best Canadian short and feature films of the year, as selected by an independent jury of filmmakers, journalists and industry insiders. Responding to concerns that the Perspective Canada program ghettoized Canadian artists, TIFF disbanded it in 2004 and instead began to include Canadian films in the various other programs. The dissolution of the program signalled to many that Canadian filmmakers could stand alongside their international peers. Additional Canadian film programs such as Canada First!, which featured debut directors, and Short Cuts Canada, were also absorbed into international streams in 2012 and 2015, respectively. Similarly, TIFF programmed classic Canadian films in the Canadian Retrospective program (2003–07), which focused on the work of a single filmmaker, and Canadian Open Vault (2000–11), which featured a single Canadian film. These were ultimately condensed into the TIFF Cinematheque. Cameron Bailey is interviewed at TIFF's Festival Street, 10 September 2014. Over the years, TIFF’s growth has resulted in some controversy, as the size of the festival frequently inspires criticism of corporatization and of selling out to Hollywood, although showing Hollywood films was part of the original festival mission. In a scathing article published after the 2016 festival, Variety film critic Peter Debruge wrote that “TIFF has become a dumping ground, serving up hundreds of new movies with hardly any discernible sense of curation. Aristic director Cameron Bailey seems to accept virtually any film with a couple starry names in the cast — provided that they agree to walk the red carpet, of course.” Similarly, ballooning ticket prices and an oft-criticized ticketing system have been seen to restrict access and favour exclusivity. TIFF responded to some of these concerns in 2017 by streamlining the festival’s lineup by 20 percent from the previous year. It also dropped two of its 16 curated programs and two of its 11 public venues. The 1978 festival featured an opening night sensation when In Praise of Older Women, from ambitious young producer Robert Lantos, faced censorship from the Ontario Censor Board. The festival capitalized on the controversy to build hype, and the premiere oversold and saw a near-riot as patrons with tickets were unable to attend. In 2004, animal rights activists protested furiously against the documentary Casuistry: The Art of Killing a Cat, about three Toronto men who tortured and killed a cat on camera (not shown in the film) as part of an art project. Protestors demanded that the film be pulled; after it was not, they picketed the screenings. Opposition was so vicious and vocal that the programmer who selected the film received a death threat at his home. TIFF faced scrutiny in 2014 when it responded to the increasing infringement on its premieres by the Telluride Film Festival. Telluride, a relatively small festival in Colorado attended primarily by industry insiders, frequently previewed TIFF selections without controversy until the growing media attention made it difficult to contain reactions before a film “premiered” at TIFF. In a call for transparency, TIFF artistic director Cameron Bailey announced that films playing during TIFF’s coveted first weekend must be world or North American premieres. Some distributors called the move “imperialistic.” TIFF has since softened its stance by reserving premium venues for top tier premieres during the first four days of the festival. Audiences were generally indifferent, with Telluride premieres The Imitation Game (2014) and Room (2015) winning the TIFF People’s Choice Award in consecutive years. Jennifer Aniston arrives at the Toronto International Film Festival for her new film Life of Crime on September 14, 2013. TIFF’s top award is the People’s Choice Award, an audience award for which festival attendees casts ballots. In addition to aforementioned films, notable winners include Rob Reiner’s The Princess Bride (1987), Michael Moore’s Roger & Me	(1989), Baz Luhrmann’s Strictly Ballroom (1992) and Jean-Pierre Jeunet’s Amélie (2001). Over the years, three Canadian films have won the People’s Choice Award: Denys Arcand’s Le déclin de l'empire américain (1986), Thom Fitzgerald’s The Hanging Garden (1997) and David Cronenberg’s Eastern Promises	(2007). The People’s Choice Award has come to be seen as a barometer for awards season, as many winners have gone on to receive multiple Oscar nominations, including Shine (1996), Life is Beautiful (1998), Crouching Tiger, Hidden Dragon (2000), Tsotsi (2005), Precious: Based on the Novel ‘Push’ by Sapphire (2009), The King’s Speech (2010), Silver Linings Playbook (2012), 12 Years a Slave (2013), The Imitation Game (2014), Room (2015) and La La Land (2016). TIFF added People’s Choice Awards for the documentary and Midnight Madness programs in 2009. The festival also features FIPRESCI prizes from international film critics’ juries for the Special Presentations and Discovery programs. TIFF’s Canadian awards include Best Short Film and Best Canadian First Feature, the latter of which includes winners such as Vincezo Natali’s Cube (1997), Don McKellar’s Last Night	(1998) and Wiebke von Carolsfeld’s Marion Bridge (2002). TIFF’s award for Best Canadian Feature, includes winners such as Bruce Macdonald’s Roadkill (1989), Alanis Obamsawin’s Kanehsatake: 270 Years of Resistance (1993), Atom Egoyan’s Exotica (1994) and The Sweet Hereafter	(1997), Zacharias Kunuk’s Atanarjuat (The Fast Runner) (2001), Denys Arcand’s Les Invasions barbares (2003), Jean-Marc Vallée’s C.R.A.Z.Y. (2005), Guy Maddin’s My Winnipeg	(2007), Denis Villeneuve’s Incendies (2010), Philippe Falardeau’s Monsieur Lazhar (2011) and Xavier Dolan’s Laurence Anyways (2012). In 2015, TIFF introduced the competitive program Platform, named after the Jia Zhangke film, which offers a $25,000 cash prize and seeks to boost rising filmmakers to auteur status. The inaugural winner was Canadian Alan Zweig for his documentary Hurt, about Canadian runner Steve Fonyo. Also in 2015, TIFF introduced the Primetime program, featuring six international television programs. 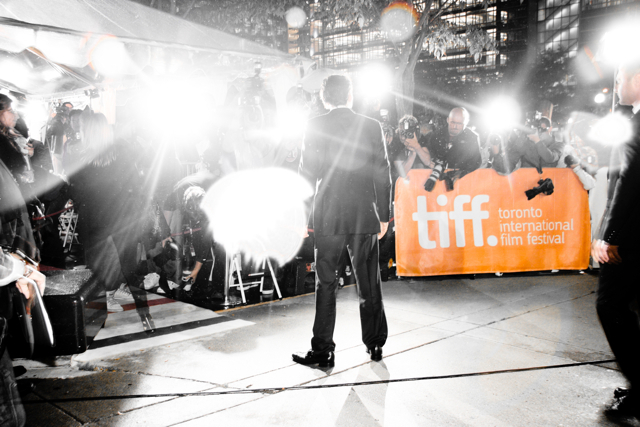 TIFF supports international and Canadian film culture through various year-round initiatives. The Film Circuit was introduced in 1989 to bring festival films to communities across Canada that are not well served by smaller distributors. TIFF assumed control of the Film Circuit in 1995 and created the Canada’s Top Ten festival in 2001. In 1990, TIFF took over the Ontario Film Institute and launched Cinematheque Ontario (now TIFF Cinematheque), which curates programs of classic cinema. TIFF created the Film Reference Library, which houses an extensive archive of film research and artifacts. TIFF began the family-oriented Sprockets festival (now TIFF Kids International Film Festival) in 1998. In 1999, TIFF began its popular Talk Cinema series (now Reel Talk) offering previews of new films with post-screening discussions. Industry initiatives through TIFF include PITCH THIS (2000–), Talent Lab (2004–) and TIFF Rising Stars (2011–), which aim to develop homegrown projects and support Canadian filmmakers and actors. Christopher Gittings, Canadian National Cinema: Ideology, Difference and Representation (Routledge, 2002). The Globe and Mail Presents: TIFF: A Reel History 1976–2012 (Booktango, 2012). Toronto Film Fest Spotlights Early Greats of Canadian CinemaWatch a clip from CBC archives about TIFF’s 1984 poll. A Brief History of TIFFRead about TIFF’s story at the Toronto Film Scene.